Jan Sirmer at the Avast blog wrote: "Based on analysis of past Locky ransomware attacks, experts in the Avast Threat Labs predict that another attack is imminent. Locky has taken a holiday of sorts. Avast detection of Locky shows that attacks have slowed down considerably during the days before Christmas through New Year and leading up to Eastern Orthodox Christmas, which is celebrated in Russia on January 7. The Avast Threat Lab analyzes the lifecycle of Locky, and they can see small peaks, new spread methods, new binaries etc., usually occurring before a new campaign starts. The graph in the blog (link below) shows data for the last 100 days. Notice that a slowdown occurs for several days before a new round of attacks; but this time it’s been more than 15 days, which doesn’t fit the pattern. The drop between attacks is not typically as significant as it has been during the 2016-17 winter holiday period. Like the Grinch, did their small hearts grow three sizes and they abandoned the ransomware racket? Why are organizations in the West subjected to relentless phishing and ransomware attacks? We need to go back in history for a bit to understand what caused this, and determine how we can best prepare ourselves. First of all, let's look at planet Earth from the following perspective: It is an anarchy of nations. The United Nations has turned out to be a disappointing, ineffective, and corrupt mess. Credit where credit is due, the U.N. has done some very good work in certain corners. The Universal Declaration of Human Rights is a excellent example, but taken as a whole, the U.N. has mostly been paralyzed. Now, let's go back to right after WWII. The cold war has started up, and there is a atomic arms race with mutually assured destruction as the only deterrent. Two superpowers at each other's throat with physical walls being built and the Iron Curtain coming down. I remember traveling with my parents passing CheckPoint Charlie from West- to East Berlin as boy, an unpleasant experience to say the least. Physical barriers were used to keep people both out and in, we have all seen the cold war spy movies, the images are vivid. 300+ New Ways to Stop Your Users from Clicking on Everything! 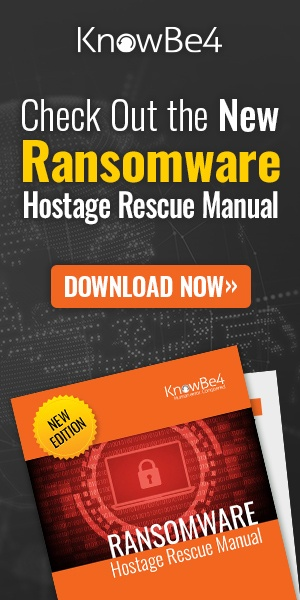 KnowBe4 today announced a game-changing partnership with The Security Awareness Company that allows you to significantly better manage the ongoing problem of social engineering. In your fight against phishing and ransomware you can now deploy the best-in-class phishing platform combined with the world's largest library of security awareness training content; including 300+ interactive modules, videos, games, posters and newsletters. We are super excited to be able to provide you with this content in an all-you-can-eat format. See a demo of "the best of both worlds" for yourself. Don't want to wait until January 19th? Get a demo now! Alright, here is another apparent backup failure. Read it and weep. They elected to pay a 28k ransom. In Bitcoins. “In consultation with district and college leadership, outside cybersecurity experts and law enforcement, a payment of 28,000 dollars was made by the District,” Los Angeles Community College District Chancellor Francisco C. Rodriguez, in a statement Friday. NEW Access to the world's largest library of security awareness training content through our innovative Module Store. NEW Send Simulated Phishing tests to your users during specified business hours with "Reply-to Tracking" that shows you which users fall for spoofed emails and what they answer to the bad guys. Active Directory Integration allows you to easily upload and synch user management, set-it-and-forget-it. Advanced Features: EZXploit™ an internal, fully automated "human pentest”. USB Drive Test™ to test reactions to unknown USBs. DarkReading wrote: "Ransomware has businesses concerned - with good reason. Organizations across all industries are at risk of infection via email or Web attacks. The vulnerabilities, and dangers, of the Internet of Things are well documented. And a growing number of experts are now saying that the market will not fix them – it will take government regulation. Tailor Amerding at ITWorld wrote: "The private sector often views government as the problem, not the solution. But, in the view of a growing number of experts, the opposite is true when it comes to addressing the rampant and increasing security risks of the Internet of Things (IoT). While it is not a unanimous view, there is general agreement that the blessings the IoT brings to modern life are being undermined by its curses – and that the market will not correct those curses." Five Groups of attackers are competing with a new tactic that involves deleting publicly exposed MongoDB databases and asking for Bitcoin to restore them. In a matter of days, the number of affected databases has risen from hundreds to more than 10,000. If you do these type of sessions, here are a few good tips! Honda unveiled its self-balancing motorcycle, which can even follow its owner while he or she is taking a walk. Wow, how do you get that thing into a curve? A hilarious, adorable, and heartwarming roundup of the top doggies and puppies of 2016.